Last week, we did Cub Scout camp. For five days, I spent the hours between 8:30 and 5:30 at a campsite, helping boys do crafts, shoot arrows, use slingshots, cook in a cardboard box oven, play football and badminton, and generally just be dirty, busy, loud, active, competitive boys. My two sons participated in camp, and my daughter worked her tail off as a junior volunteer. Each night, we came trudging into the house, peeling filthy socks off our feet, dropping the camp t-shirts into a pile, and flopping onto the couch. Dinner needed to be something simple, and something quick for these kids who had run, climbed, swam, and hiked all day long in the hot sun. They were hungry and tired... not a great combination. 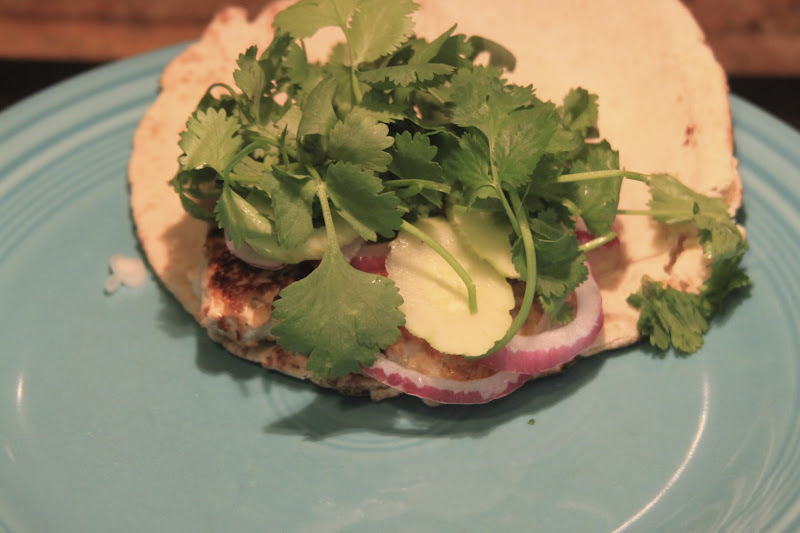 These turkey burgers did the trick! 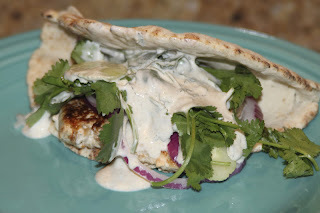 They are pretty simple to throw together, they can be grilled in just a couple of minutes (while the kids hose the first layer of grime off each other), and they are TASTY. 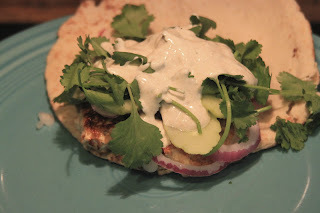 Topped with cilantro, onion, and cucumber, and a delicious yogurt sauce, they are nice and light and flavorful, just perfect for a hot night. The recipe came from Bake Bree, and I only made a few tweaks. Using your hands, combine the turkey, green onions, ginger, lemon juice, and spices. Form into 4-5 patties. Grill over medium-high heat until cooked through. Grill the pita bread for the last couple of minutes. Meanwhile, stir together all of the ingredients for the yogurt sauce. Place a burger patty onto each piece of pita bread. Top with the cucumber, cilantro, and onion. Drizzle on some sauce, and enjoy!